Once again, historic houses look like they are slated for the wrecking ball, and the public has little recourse. Both Victorian houses at 1312 Bass Ave., and 1316 Bass Ave., have had demolition permits applied for, according to this May 6, 2016 article in the Columbia Missourian. So what can the public in Columbia, Missouri do? Nothing. Unless the development planned would violate zoning permits or cause harm to public safety, property owners have the right to do what they like to their property. Who is behind the destruction of these historic buildings in Columbia, Missouri? It’s good to recall these things happen because someone wants them to happen. These are not strangers coming to Columbia to destroy our historic homes, but people just like you and me who decide they’d rather have a different building on their property. In this case, those people are Elizabeth Crawford through her firm CCD Investments. According to public records, CCD Investments is an eight-year-old firm headquartered in Columbia. Another person involved owns Connell Architecture, and public records show the owner of this firm is Brian Connell. Sometimes we lose sight of the fact that real people are taking real actions we may or may not like, as in this case. But the reality is that owners of property can do what they like with their property, unless public funds are involved in some way such as when historic preservation tax credits are used for renovations. The article outlines that once again, the proposed use of the land, after the two 1910 circa homes are destroyed, will be apartments. Apparently, both Crawford and Connell think the needs of Columbia, Missouri would be better served by a three-story apartment complex with 48 bedrooms than two Victorian homes. But I think the real loss of these homes is not the stained glass windows, the textured brick walls or event the decorative features of these Victorian homes. No, we’ll lose the story of the people who lived there. Who recalls William T. Bayless? Perhaps no one. But William Cochran may have been the man who helped organize the Presbyterian Church, according to this April 12, 2009 article in the Columbia Daily Tribune. Once the house is gone, no one will go looking for the history of Mr. Cochran or of Mr. Bayless. Perhaps offspring will come by and look for their memorial stones, but there will be no space, no living room, no bedroom, no garden, no bricks and mortar where their ancestors lived and perhaps died to look at, to see how they lived. And that is the real loss of any home. So now, Columbia, Missouri and the East Campus Neighborhood will gain eight four-bedroom apartments and eight two-bedroom apartments. Might be a fair deal, but that’s not our call. It’s not for the public to say, but for the owners of the development firm, Elizabeth Crawford and those at the construction firm Crawford Construction and the architect, Connell Architecture to say. It’s their call, but Columbia’s loss. If you live in Columbia, Missouri, you’ve probably heard a 1903 former hotel is coming down. But you might not know that you can help save pieces of this historic building for salvage, even, perhaps for installation elsewhere downtown in the future. Here’s a look at what can be saved and how you can help. Louvered doors in the former Winn Hotel, 1903, 121 S. Tenth St., Columbia, Missouri. Photo used with permission. 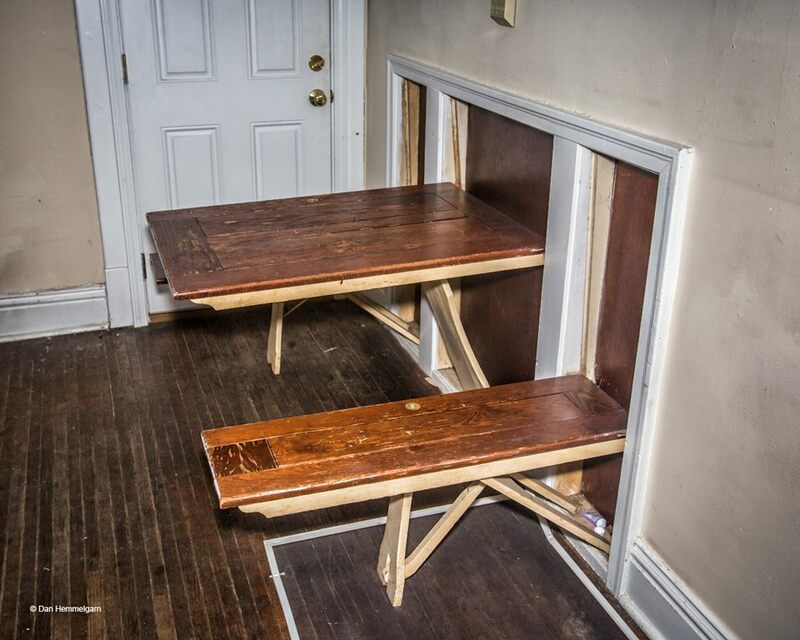 In-wall tables in the former Winn Hotel, 1903, 121 S. Tenth St., Columbia, Missouri. Photo used with permission. “Thank you for agreeing to share this information with your students, circle of friends, family members and co-workers. At last look we had 29 of our slots filled, with 100 more to go. Some slots are 2 hours, some are 4 hours, all contribute measurably to the greater goal of saving what is unique and special about the James (formerly the Winn Hotel and the Tenth Street Elks Lodge). We welcome our volunteers signing up for more than one shift if their busy lives permit. Send any questions via email to fowlerpatj@gmail.com or text 573-256-6841. Our planning team: On site Rosie Gerding and I will share volunteer coordinator duties, one of us will be on premises for the duration to greet each of the volunteers, provide breakfast snacks, coffee, lunch food, beverages, get what ever is needed from what ever source, and make certain we have cleared your path, literally and figuratively, to get the work done as efficiently as possible. Dan Cullimore, Kelly Veach, Douglas Jones and Mark Wahrenbrock will lead teams in de-construction, door and hardware removal, fixture removal and a handful of us will assist Habitat’s ReStore with our appliance dollies in getting the 21 refrigerators, several of the stoves and a new, still in the box, water heater out the door and to their truck. Though we can’t save the building, we can save many of the items that are uniquely the James. I’ve attached both our most recent flyer and a photo array of many though not all of the items we seek to remove safely for re-purposing. Please spread the word. If you have a few hours to participate, please use our sign up tool; we look forward to greeting you inside the front door of the James. The 1903 James Apartments, once known as the Winn Hotel and the Elks Lodge, is set for demolition, but not all is lost. These articles summarize how Historic Preservation Commission member Pat Fowler organized a group of people to swarm, document and brainstorm how to save the best pieces of the building. A date for removal will be set and an electronic sign up sheet will be posted soon. Below is a gallery of photos and then a list of the recent articles about the upcoming demolition of the building at 121 S. Tenth St.
121 S. Tenth St. Murphy tables, March 1, 2016. 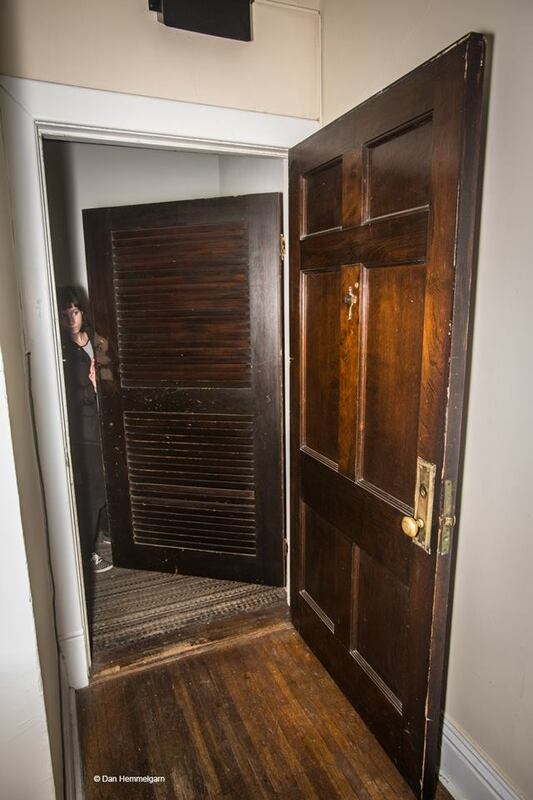 Solid wood doors and hardware saved prior to the demolition of the James Apartments at 121 S. Tenth St. The foundation of 121 S. Tenth St., stone likely quarried locally. Views from 121 S. Tenth St., March 1, 2016. But if you’d like to get a peek inside now, before the crowbars get going, here are three views of the building, including that of an MU law student who plans to work with officials to get zoning put in place to stop the loss of other historic buildings and to support affordable student housing downtown. I attended this documentation, list-making event, and here are pictures from that event, Tuesday, March 1, 2016. Here’s a link to a 2006 document for a designation for a National Register of Historic Places. Why should we care about one building being demolished? One building older than 100 years doesn’t seem like much to lose. We have lots of buildings, right? Yes and no. This Feb. 16, 2016 article by Brittany Crocker with photos by Mikala Compton published in the Columbia Missourian explains why the loss of one building can do so much harm. Zip down to the part where Deb Sheals, a historic preservation expert, is quoted. Sheals goes on to note how the Niedermeyer was saved several years ago. Columbia City Council couldn’t say no to someone using the property and the land in whatever way he or she wanted. Instead, a local person bought the property and is restoring it. In this case, the owners of the James Apartments said they had an offer from a developer that was too lucrative to refuse. So after gaining rents from the building for years, a profitable offer came and they took it. There’s no way to ask the former owners of the building how they’ll feel about Columbia once it is all high-rise apartments. Whether they’ll go downtown to shop or eat when they’re so sunshine able to make its way to the sidewalks. And there will be no way to go back to the quirky look of Columbia once it’s all high-rise buildings and franchise eateries. Because that character, that look, those historic buildings will be lost. Perhaps something better, grander, more interesting will be in its place. Certainly, whatever was there before the Tiger Hotel was there is gone, and who doesn’t love the historic Tiger Hotel. But I’m not personally convinced that a 10-story apartment building is going to be the treasure that the Tiger or the Missouri Theatre have become. But I need to be willing to wait and see because the James Apartments will soon be history.